When I started constructing my current fish room I tried to compartmentalize each rack into a stand alone system. Thinking along those same lines, I constructed a rack specific to green water and other cultures. It’s nothing fancy and fits in well in my “working” fish room. The rack has two 40 gallon breeder tanks for the green water cultures and a large shelf on top for daphnia, moina, and brine shrimp cultures. I was fortunate enough to pick up these tanks from a fellow C.A.F.E. member. They are bottom drilled, and just a bit scratched up, but the price was fantastic and they are just a perfect fit for this project. I’m not sure if the turtle will be able to produce enough “nutrients” to grow green water in both tanks. If not, I’m thinking of adding some feeder gold fish to the bottom tank. They should be just about the right size for someones pond next spring and I can start again with small fish. They could also pull double duty and eat any excess duck weed it find in other tanks. The rack is my standard 2 x 4 lumber and carriage bolt construction. It was made wide enough that the tanks will easily slide in and out from the front. 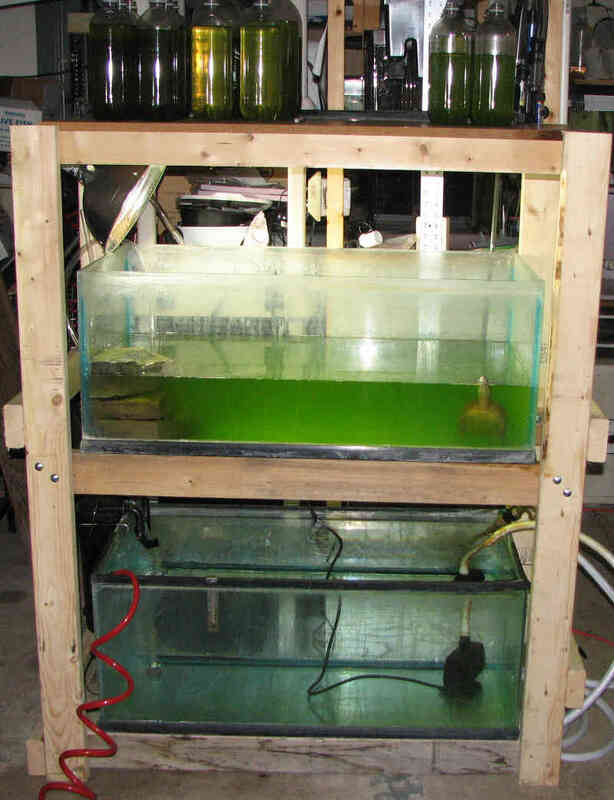 At first I had though to build the rack just 36 inches wide, but with the green water and the tanks possibly needing more frequent cleaning, I though it would be best to go wider. 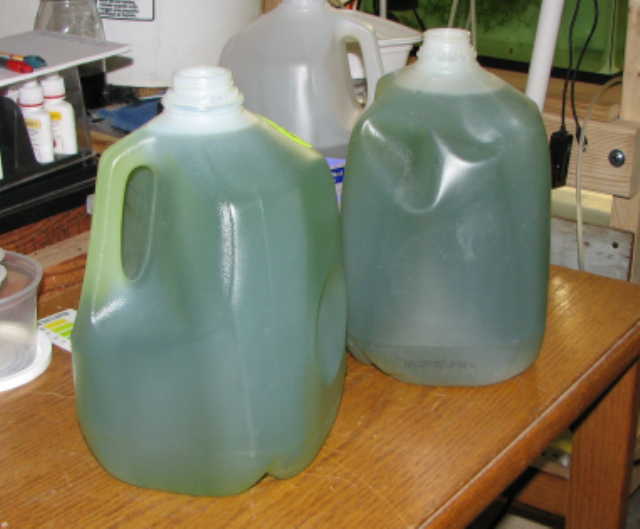 Well there should be smiles all around the fish room with the increased supply of moina and daphnia that will now be possible! As the main interest in my fish room is the spawning of my fishes, you can never have too much live food available. You don’t say how much light and for how long. Thank you for sharing this information with everyone. Previous Previous post: Devario acrostomus – A Fall Auction Treasure!